This cabinet consists of a mahogany case with brass swan neck carrying handle to the top leading down to two doors with two oval brass escutcheons. 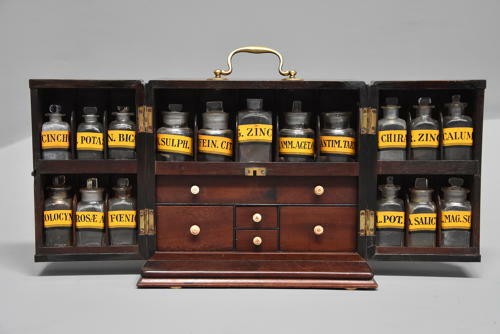 The doors opening to reveal a good selection of medicine bottles with paper labels, the central section holding five bottles with an arrangement of fitted drawers below with glass bowl, scales and weights, the opened doors also holding six bottles on each side. To the rear of the box is a secret sliding compartment opening to reveal 4 larger bottles, also with paper labels, these bottles being of poisonous substances. This travelling apothecary cabinet is in very good, original condition for age, is of stable construction and can go straight into a home or collection.